hungry lumberjacks back in the late 1800s. This means of cooking fish soon filtered out to the local population and fish boils have been a staple of the Door County experience ever since. The mere mention of boiled fish has never sounded appealing to me. And, when I found out how the fish was cooked, I was even less enthusiastic. Lake Michigan white fish is cut up into chunks and thrown into a kettle of salt water with red potatoes and set atop a blazing bonfire. Generally, restaurants that host fish boils ask you to make an appointment for the boil and then have you arrive a half hour early so that you can witness the elaborate presentation that encompasses the boiling process. The boil master at The White Gull Inn is quite the showman and it was fun to watch him conduct the boil while everyone sat back, had a few drinks and watched intently. If you haven't attended a fish boil before and your server offers to show you how to de-bone your fish steak, make sure you accept. With just a little instruction, I able to easily fillet the meat. 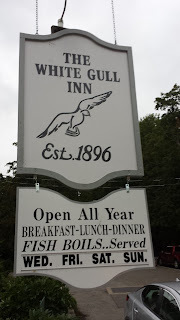 The White Gull Inn has some great tartar sauce to go with the fish, but the real winner is their butter sauce. For a moment, I actually thought I had been eating lobster. Most fish boils are "all you can eat" affairs, and I decided to go for seconds. Our server remarked "The great thing about going for seconds is that you get to eat fish tails!". I was almost afraid to ask if thirds would include fish heads. There's a reason why fish boils at The White Gull Inn are one of the most popular in Door County. It's a class act all the way, from the ambiance of the restaurant (including classical guitarist) to the friendliness of the servers to the showmanship of the boilmaster. And, while I was very skeptical of eating boiled fish, it turns out that it actually tastes really good. Just make sure you save some room for cherry pie a la mode. On a side note, I have heard from many people in the area that The White Gull Inn also offers the best breakfast in Door County. I might just have to try it and judge for myself.